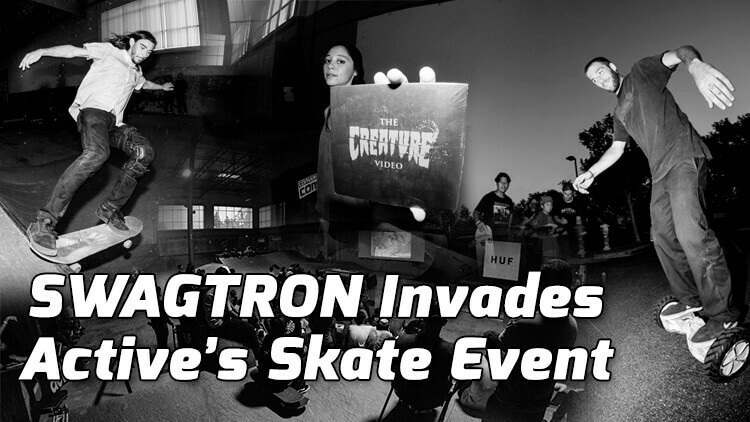 Creature Demo & Video Premiere at Active Ride Shop in Rancho Cucamonga, California. Premiered the new Creature Video later on that day to a crowd of eager skaters and Creature Team riders. You can’t see us but we’re in the middle of the photo sitting on the rail next to the guy in the white watching the video with some Creature folk right in front of the screen, lol. Then we went outside and cooled off, like we always do by riding around and getting some wind with an electric voyager longboard and then on the T6 hoverboard, or self balancing scooter. As the day progressed, more people started trying out the T6 All Terrain Hoverboard and the Electric Longboard (Voyager) that we brought with me to cool down. This is also from Active Ride Shop’s Facebook page: Check out the black offroad T6 in the background? Lots of T6 footage fun! Stay tuned for more of our weekly episodes @the_skatepark! Next up will be our Norcal trip & Sk8 kamp fundraising while rideables’ing with friends and interesting skate sessions incorporating hoverboards and electric skateboards. Buy yourself the T6 SWAGTRON All Terrain / Off-road Hoverboard Right now!